The search for solutions to skin related problems is almost never ending. This includes miracle creams, wonder scrubs, and a whole lot of different options. 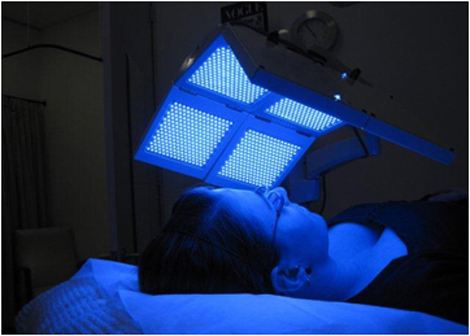 You might have even heard of a high-tech treatment for acne and wrinkles called LED (light-emitting diode) therapy. However, despite the hype, this treatment is not the first or best option for addressing skin disorders like acne and wrinkles. LED for skin treatment should be considered as a complement for a well-formulated skin-care routine. Similar to any other skin treatment, there are pros and cons that should be considered before deciding whether LED for wrinkles or acne treatment is the best option for you. Let’s see the pros and cons of using LED for acne and wrinkles. Here, specific wavelengths of blue light target the bacteria that play a pivotal role in causing acne. The light causes the development of oxygen radicals which kill the P. acnes bacteria, without causing damage to the surrounding healthy skin. Here, wavelengths of red light may help improve the skin’s barrier function by improving the ability to retain the key elements it requires to heal. It is also believed that red light LEDs stimulate healthy collagen production and target the oil glands in the skin to lower cytokines, a class of pro-inflammatory substance that’s believed to play a role in chronic acne. In case you’re considering an at-home LED device for anti-aging or clearing acne, it’s recommended to reconsider it. Due to concerns over lawsuits, manufacturers of such devices are forced to limit the intensity, often to a far lower strength than the LED devices used by a dermatologist. Furthermore, LED devices require protective eye wear because the wavelengths emitted through them can damage unprotected eyes. Without protective eye wear at home, there’s a risk of damaging one’s eyesight due to the high intensity output from the device. Also, at-home lasers are “FDA approved” for what is considered as a “class 2 medical device”, meaning the FDA has approved the laser for safety and not effectiveness. With regards to treating acne, in-office dermatologist administered LED for skin treatment is worth considering if other topical medications fail to work. Keep in mind, skin-care products with benzoyl peroxide, tretinoin, salicylic acid and other medical options are your first line of defense. Taking into account the expense, it is worth saving up for treatments which have actually shown to provide better anti-aging results. This includes laser treatment with Fraxel or Ulthera, or light-emitting treatments like IPL (Intense Pulsed Light).